I love the Manchester Evening News. Actually, that’s not true. It’s an occasional pity purchase – I want to support the idea of a vibrant local media that keeps tabs on the Council and other unaccountable centres of power, breaking important stories. But while I’m waiting, I buy the MEN. For the recycled press releases, y’understand. So, to start again. I love the uninentional (?) laughs you can get from reading between the lines – or in the following case – across the articles of the MEN. It may be that there’s a subversive sub-editor who has placed the following stories together. Nowhere in the article does reporter Alice McKeegan mention that Manchester Airport is majority owned by, erm, Manchester City Council. (The remaining 45% is dolled out to the other 9 AGMA local authorities). And inevitably the words ‘climate change’ do not appear. Or any mention of the unfortunate reality that some day (MCFly can’t say when), Manchester City Council is going to have to take responsibility for a proportion of the emissions generated from the dirty great big metal birds that take off and land at the nest provided by Manchester Airports Group. And that this will sink all hopes of reaching a “41% reduction of carbon dioxide emissions by 2020”, as agreed in the Manchester Climate Change Action Plan. I love the Manchester Evening News. 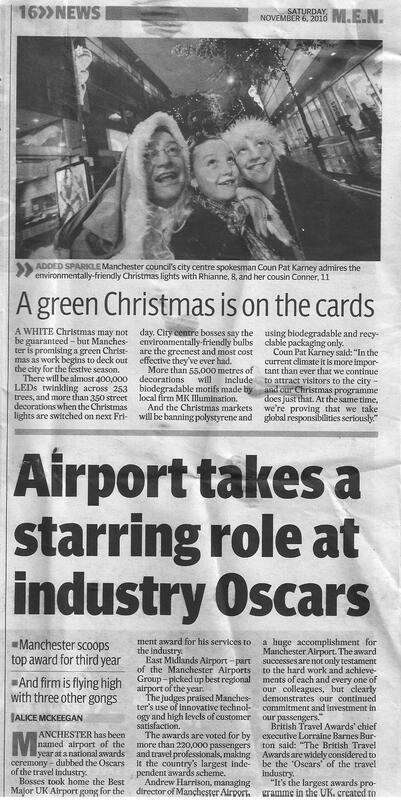 This entry was posted in Airport, aviation, Manchester Airport, Manchester City Council, Manchester Evening News. Bookmark the permalink. Who needs satire ? A subversive sub? or a blind one?